How On Earth Do You Use Lush’s Solid Toothpaste and Mouthwash? Solid mouthwash, say what? 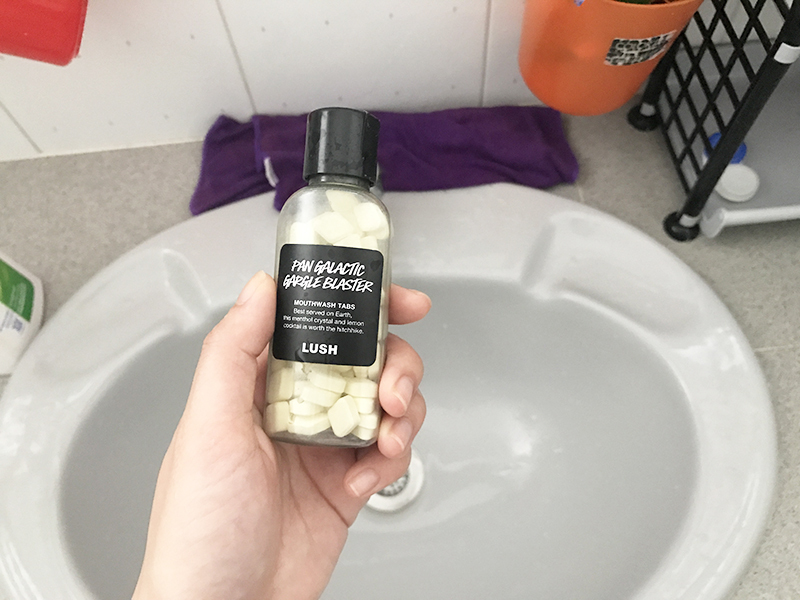 And it wasn’t just that: Lush also sent over the Toothy Tabs in a bunch of flavours, and those are essentially solid teeth cleansers that come in the same tablet-like form as the Mouthwash Tabs. Of course, in a bid to have what must be one of the most unique mouth-cleaning experiences possible, I had to give both a try together. Of all the Toothy Tab flavours sent to us, I picked out the Bling!, which has tablets that come coated in a shimmery gold powder (edible, of course) and promise to make your teeth dazzle as you brush them. Sounds fun. 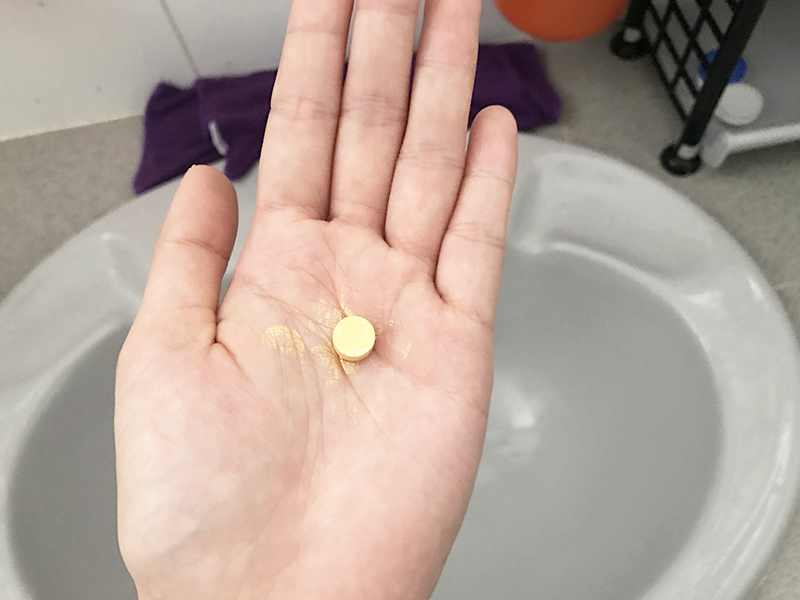 FIRST IMPRESSIONS: I dispense one golden tablet into my palm, and I honestly can’t believe I’m to use this to brush my teeth. It emits a faint sweet-spicy scent that’s courtesy of the frankincense, as stated on the label, which is not at all like what regular toothpaste is supposed to smell like. The golden sparkle rubs off a little on my skin immediately, as seen in the photo. The instructions on the back of the bottle say that I’m supposed to bite on this, and use my regular toothbrush to brush as usual. PROS: Once I put it in my mouth, I find that this doesn’t taste too bad. It mixes with my saliva to foam up relatively quickly, and the Brazilian orange oil in it produces a pleasant light citrusy flavour. CONS: The most disappointing thing about this was, there was none of that promised bling on my teeth. 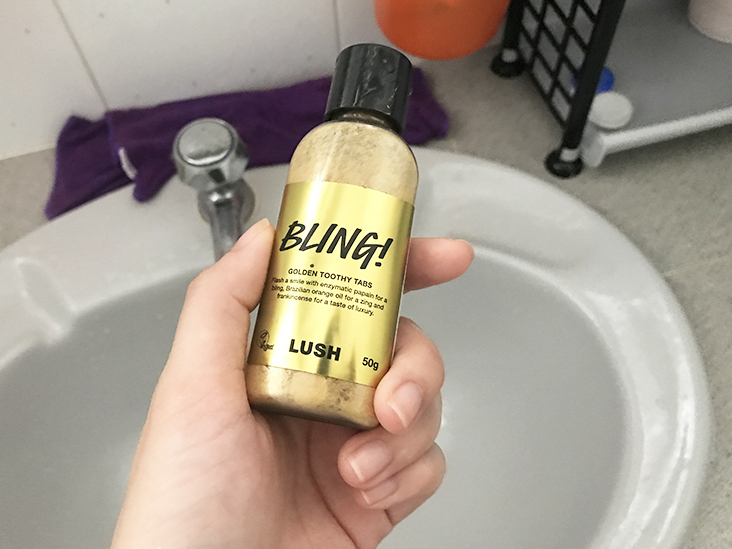 I mean, I’m not expecting my teeth to be covered in glittery gold foam, but I thought there would be at least a tiny bit of sparkle – isn’t that the whole point of the novelty factor? Instead, the foam produced came in regular boring white with no sign of even a slight golden hue. Also, biting on the Toothy Tab takes some getting used to. I “nibbled” on it as instructed and then applied my toothbrush to my teeth, but I realised that mere nibbling wasn’t sufficient to break up the tablet enough, so as I brushed and moved the tablet bits around my mouth, that ended up hurting my gums a little. Once I had rinsed it off, the aftertaste was mildly sweet, but I find that the stronger mintiness of regular toothpaste is better at combating morning breath. I chose this one because I favour citrusy mouthwashes, and the main ingredient of this one is lemon oil. It also helps that product name is really cute. FIRST IMPRESSIONS: Popping a tablet into your mouth and then gargling with water is surely more troublesome than just gargling regular liquid mouthwash, but once again, it’s all in the novelty factor. This one tastes like a lemon-flavoured mint when I put it in my mouth. 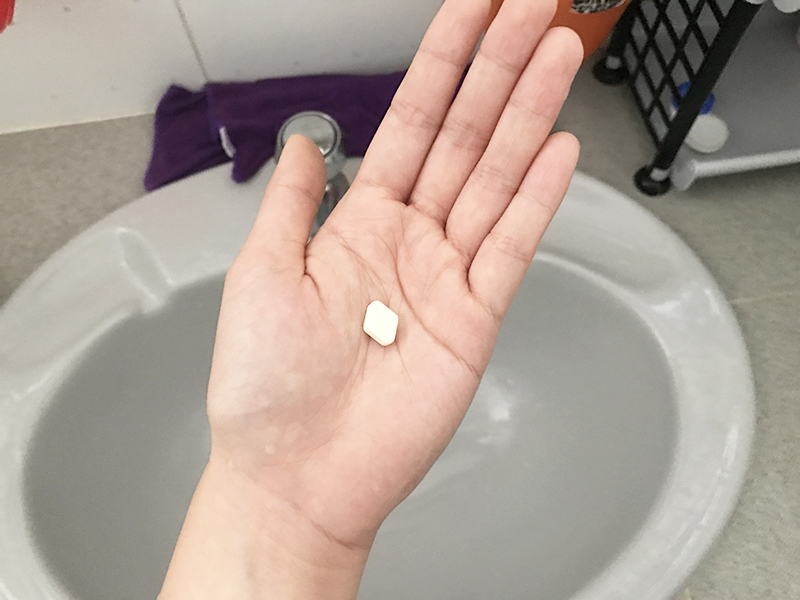 PROS: While it comes in the same format as the Toothy Tabs, this one is easier to use since a mouthful of water dissolves the tablet much quicker than just saliva, so I didn’t end up with little bits of the Mouthwash Tab hurting my gums. The way it fizzes when mixed with water felt quite nice too, and despite it not being a mainly minty flavour (there are menthol crystals in it though), I did find it sufficient for getting rid of morning breath, as well as the aftertaste of dinner. CONS: Like the Toothy Tabs, if you’re looking for a strong minty taste in your mouthwash, this one doesn’t have it. What it does leave behind is a subtly sweet aftertaste, still sufficient to feel fresh enough in the mornings though. VERDICT: Overall, these were very interesting to try. I’ve personally never seen any other brand that does solid toothpaste and mouthwashes, so Lush is the first to get into the game. For sure, these will be super handy for travel, since being solid, you can pack the bottles into your cabin bag and use them for freshening up mid-flight. They’re not as user-friendly as regular toothpaste and mouthwash though, which just goes to show that there’s a reason every other oral health brand in history has stuck to the traditional gel and liquid formats. Another thing is that the Toothy Tabs and Mouthwash Tabs don’t contain fluoride, the main ingredient in many toothpaste formulas that helps with improving dental health, and preventing cavities. Fluoride is a slightly controversial ingredient within some circles though, so it might not be an entirely bad thing. While I wouldn’t replace my regular Darlie toothpaste and Listerine mouthwash entirely with these as Lush’s options just aren’t minty enough for my liking, but this is a fun option to switch to now and again. LUSH Toothy Tabs and Mouthwash Tabs, $13 to $18. Available at LUSH stores and on lushsg.com.